Creamy, comforting, delicious and healthy! The temperature is starting to drop…just a little. Ok, so it was 75 degrees today. At least it wasn’t 85, and with the evenings cooling down, I was ready for some soup! I have made this soup many times and my family really likes it. 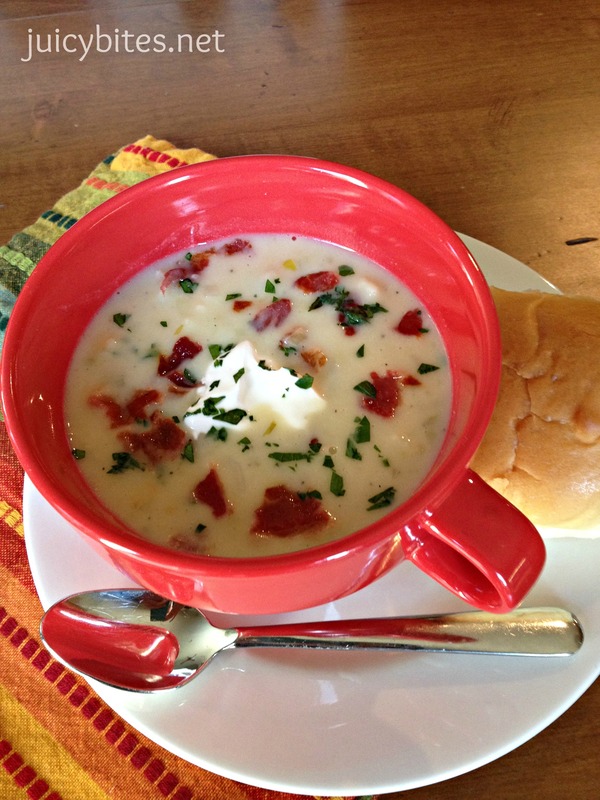 It is one of my kid’s favorites (they call it Snowman Soup) and I love that it is packed with good stuff. This soup tastes rich and indulgent…but it’s healthy! I know cauliflower is not on very many people’s list of favorite veggies, but it really is delicious when you cook it the right way. 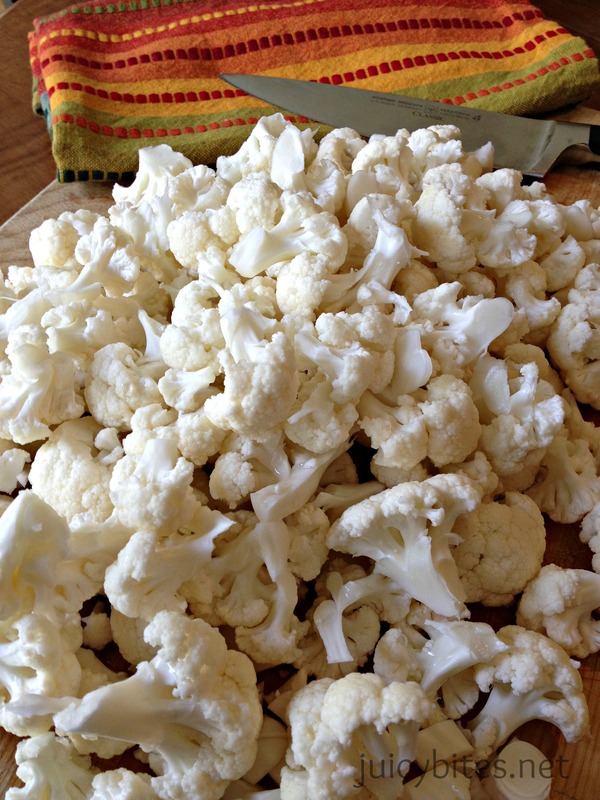 I love it roasted with olive oil or in one of my favorite dishes…Linguini and Cauliflower (I will post that one some day!). One of my favorite blogs, In Pursuit of More, has an has an amazing post on Roasted Cauliflower and Kale Pesto that you MUST check out. Her pictures make cauliflower (and kale) look like a superstar. 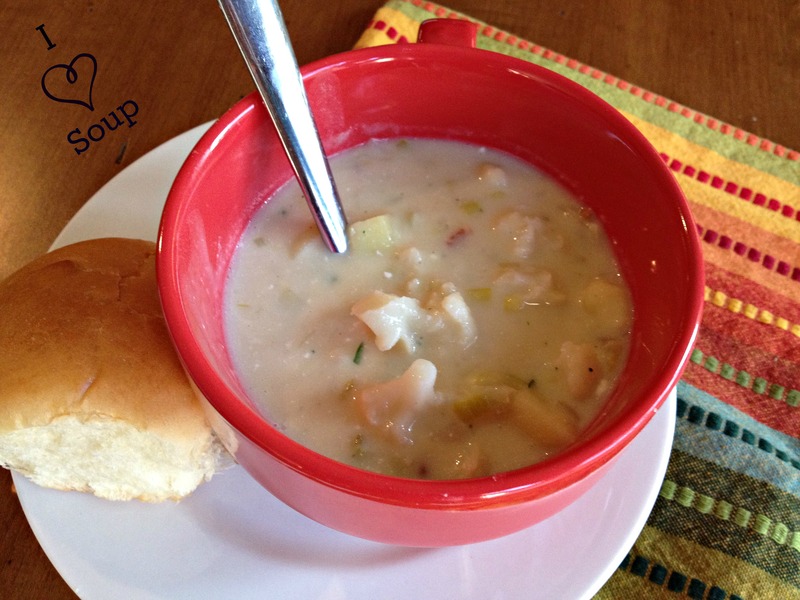 In this soup, the cauliflower works so well with the creamy yukon gold potatoes. They are a match maid in heaven. 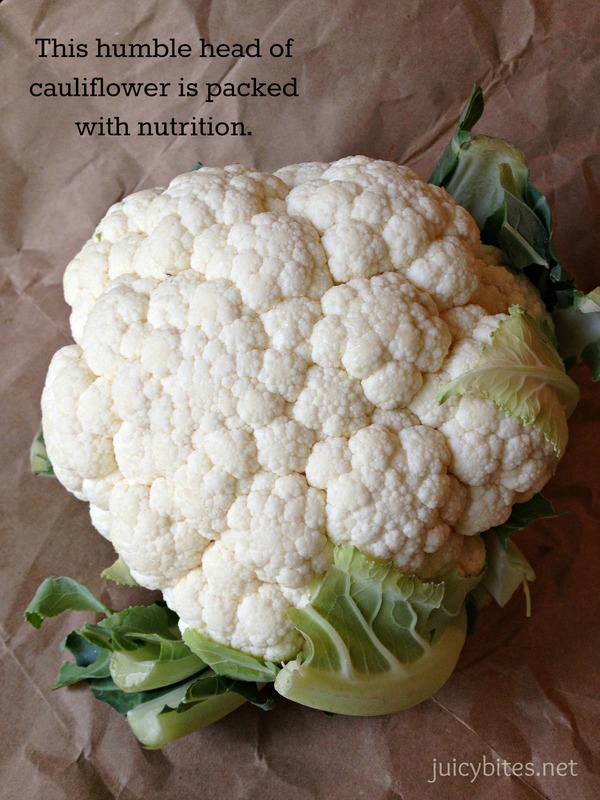 Make sure you break down your head of cauliflower into small florets that are bite size. It may seem like you have a ton of cauliflower in this recipe, but it cooks down and you puree half of it so it ends up working out just right. I love having creamy texture, but also having nice big bites of cauliflower and potato. There’s something about a totally pureed soup that just doesn’t seem like a meal to me. I like them as a starter, but if soup is the main dish, I like to have something to chew on. If you have picky eaters, you may want to try to puree the soup completely smooth for them. Most kids like potato soup and they will never know that there is anything potentially yucky in it. Beans? In a cauliflower and potato soup? Yes! I puree these cannellini beans in my blender with a little half and half (whole milk would work too, or even soy if you want to go non-dairy). 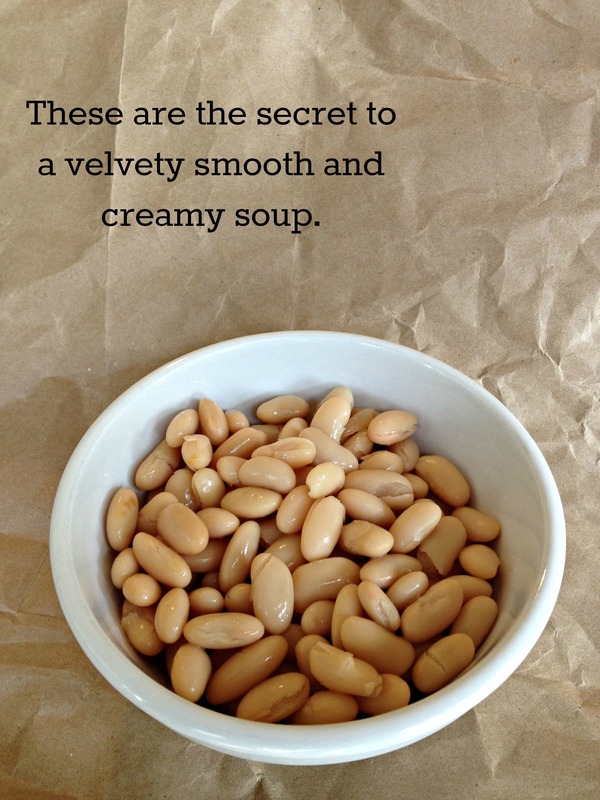 You end up with a smooth and creamy puree that gives the soup really nice texture and body. You would have to add a cup of heavy cream to get the same creamy, thick soup without this trick. Not that I’m against adding a cup of cream to anything, it’s just not something I normally do when I’m cooking my family a weeknight dinner. Lots of sauteed leek, onion, and celery give this soup great flavor. Make sure your veggies are nice and tender before adding the rest of the goods. Don’t rush this step because it is an important part of building the good flavor of this soup. This recipe makes a good size pot of soup. If feeds our family of four (with seconds, of course) and makes great leftovers. My boys love to take it to school in a thermos. 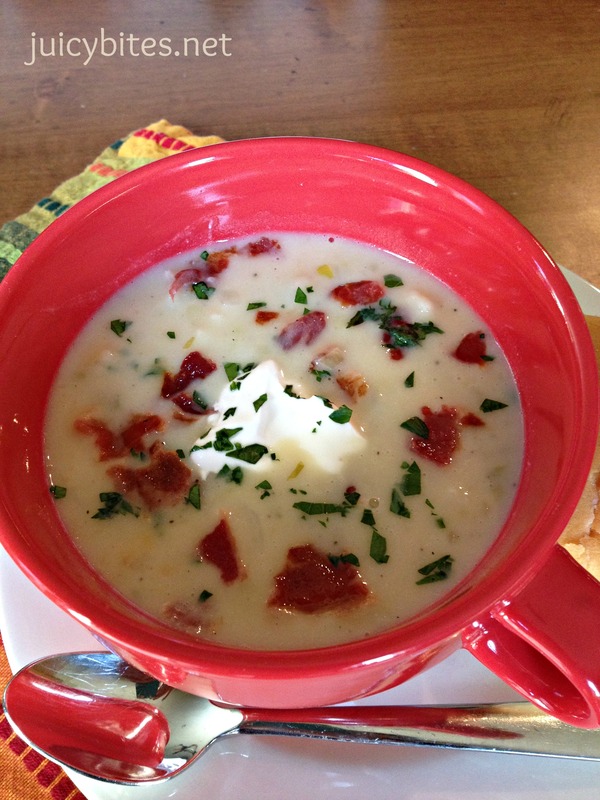 I think I saw rain in our forecast for Thursday…this is the perfect lunch on a rainy day! 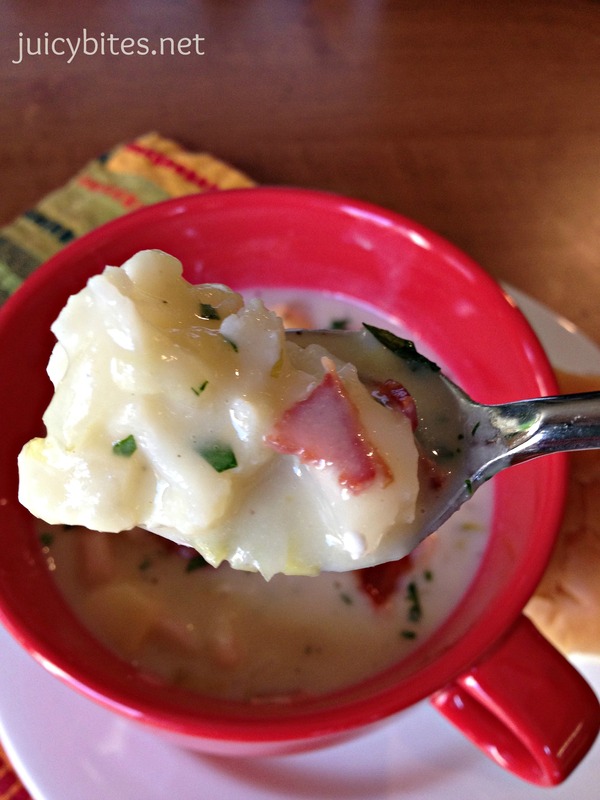 This soup screams for some good crumbled bacon on top. A little dollop of sour cream is nice too! Oh…and you MUST have some good crusty bread or rolls with it. A salad is totally optional and I find that it usually just gets in the way :). 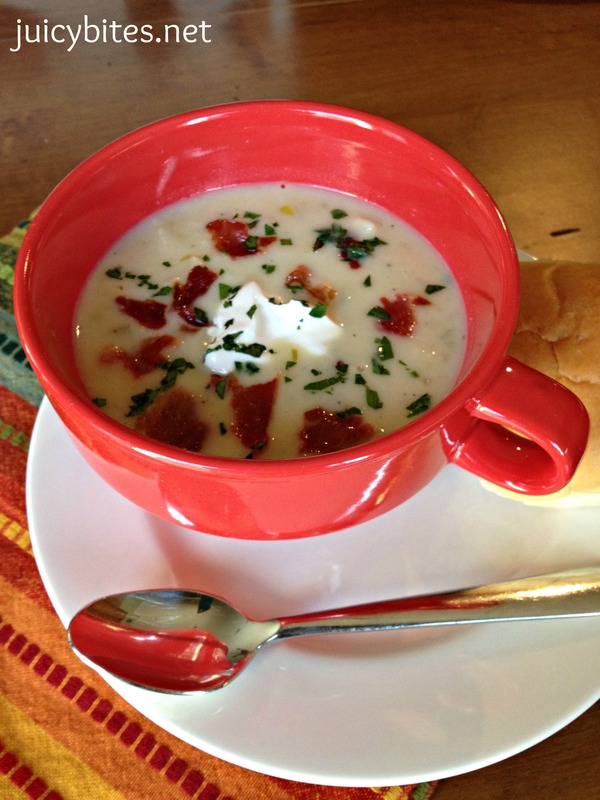 Even if you don’t like cauliflower…I dare you to try this soup. I bet you will change your mind. In a large heavy pot (like Le Cruset), heat the olive oil and butter over medium heat. 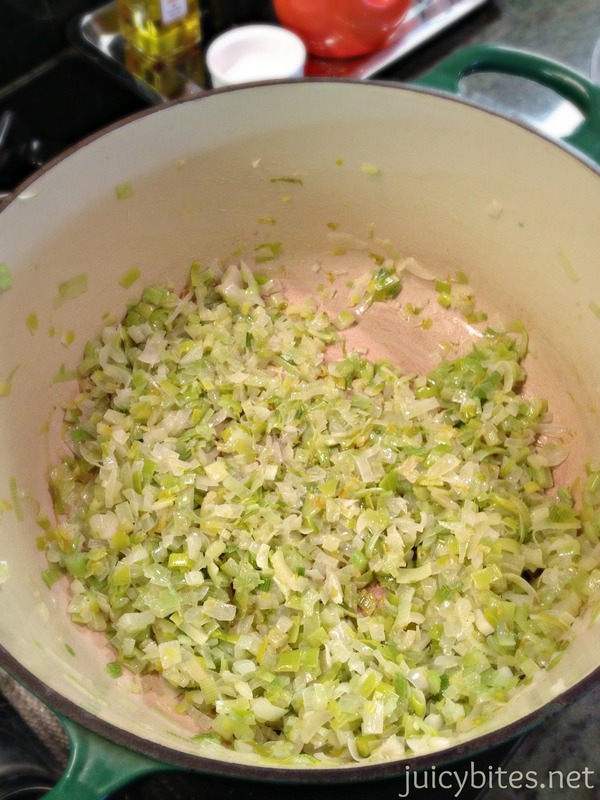 Add the leeks, onion, celery, and a pinch or 2 of kosher salt and cook until they have softened (about 10 minutes). 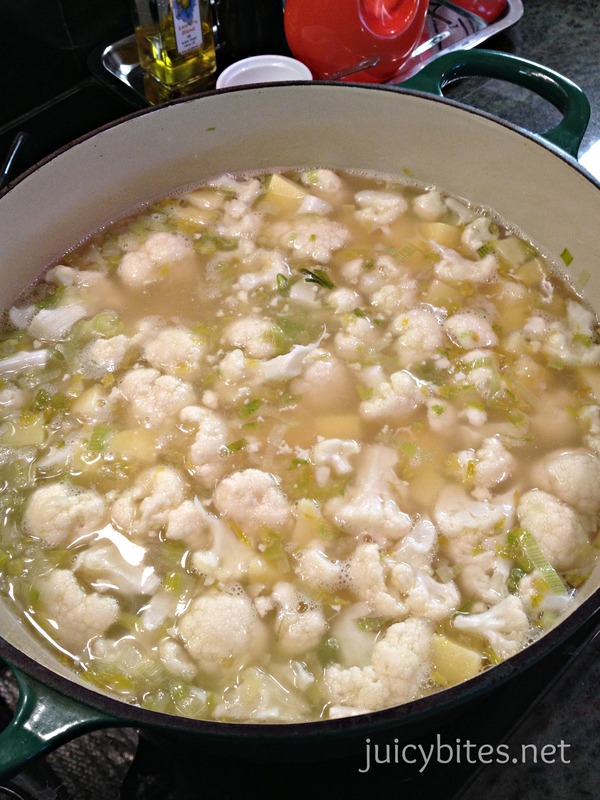 Add all of the cauliflower, the chicken stock, and the potatoes and season with more salt then bring to a simmer. Cover and let cook until the cauliflower and potatoes are very tender (about 15-20 minutes). Meanwhile, in a food processor or blender, blend the drained cannellini beans and the milk or half and half until very smooth. Pour into a bowl and set aside. Once your cauliflower and potatoes are very tender, add about half to the blender (let it cool a little before blending). Blend until smooth and add back to the pot along with the pureed beans. Cook on low for about 5 minutes so that it heats through. Taste for seasoning…you may need to add more salt, it just depends on the saltiness of your chicken stock. Serve garnished with crumbled bacon, sour cream, fresh chopped Italian parsley or chives. Can’t wait to make this. Perfect weather for it.